Enjoy vacationing in this gorgeous Kiawah Island vacation rental! This beautifully constructed 5-star well equipped home, located at 143 Hooded Merganser Court, was completed in early 2017 and features 4 bedrooms, a spacious private pool deck, hot tub and an incredible lagoon and golf course views. Walk to Kiawah’s amazing beach in 7 minutes, or just take a leisurely bike ride on the path. 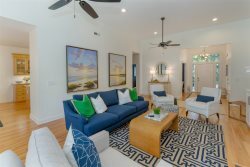 The spacious open main floor offers a living room, kitchen with generous butler’s pantry and center island, dining area, sunroom, and master suite. The master bedroom opens to the pool deck and offers a king bed and ensuite bathroom with double sinks and shower. A powder room and laundry room complete the first floor. Ascend the stairs to reach the second floor, which houses three additional bedrooms. The second master suite features a king bed and private bathroom with shower. A queen bedroom and a bedroom with two sets of bunk beds share a hall bathroom with bathtub/shower combo. Back outside, the rear deck boasts a private heated pool, a hot tub, grill, as well as an outdoor dining area for year-round enjoyment. The pool is approximately 20ft x 12ft. Soak in the sunshine, or just watch the island wildlife from your deck, while reclining in comfort. The home is equipped with washer, dryer, wine cooler, a Vizio SmartCast TV, wired sound system and high-speed wireless internet. During your stay on Kiawah Island, be sure to enjoy biking on the 30 miles of flat bike trails, golfing on one of five world-class courses, playing tennis, crabbing, fishing, swimming, and boating. Many families also enjoy the kids’ camp and nature programs at Night Heron Park. Kiawah Island is about 40 minutes from historic Charleston, famous for incredible shopping, galleries, antique stores, museums, the South Carolina Aquarium, horse-drawn carriage rides, historic landmarks, and sumptuous dining. Rates may change prior to booking and do not include fees and taxes. Great layout for families, great pool and hot tub with views, easy walk or bike to beach. Nice to come home after a day at the beach and hit the pool. Newer property so very clean. Sunroom gives space for kids while parents enjoy their space. Enjoyed watching wildlife from back deck.